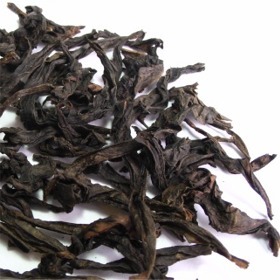 Ban Tian Yao Oolong Tea is also another famous Wuyi Oolong tea. The name of this tea is special as it means half way to the sky. It literally means that this tea breed or cultivar is grown on a high cliff and it looks like it is hanging on the sky. Ban Tian Yao Oolong Tea has a good body, smooth and complex flavor. Ban Tian Yao Oolong Tea has been around since the 18th century but it is not widely known as the rest of Wuyi Rock Teas. Organically grown. Smooth, complex body with malty sweet lingering aftertaste. Dark curly slightly twisted tea leaves.